We're excited to announce the next breakthrough in M18 FUEL™. These new solutions are a testament to our dedication of delivering productivity-enhancing solutions that provide the right blend of power, run-time and performance. True to all M18 FUEL™ solutions, each of these tools combine three exclusive innovations – the POWERSTATE™ brushless motor, REDLITHIUM™ battery pack, and REDLINK PLUS™ intelligence - all specifically re-designed to reach a new level of power and performance never seen on an 18V platform. All M18 FUEL™ tools are part of the M18™ system of over 150 performance driven, trade focused solutions. Designed for the carpenter, remodeler and general contractor, the M18 FUEL™ 7-1/4” Circular Saw generates the power of a 15A corded saw, cuts faster than a 15A corded saw and gives users up to 750 cuts per charge. The M18 FUEL™ SUPER SAWZALL® reciprocating saw combines legendary performance and durability with the M18™ System, generating the power of a 15A corded reciprocating saw, cuts faster than 15A reciprocating saws and delivers up to 150 cuts per charge. The M18 FUEL™ 8-1/4” Table Saw w/ ONE-KEY™ generates the power of a 15A corded saw, has 24-1/2” of rip capacity and delivers up to 600 linear feet of cutting per charge. Designed for the professional carpenter, remodeler and general contractor, this saw is optimized for power, portability and productivity. The M18 FUEL™ 7" / 9" Large Angle Grinder is the world's first 18v LAG, generating the power of a 15A corded large angle grinder, is up to 2 lbs lighter, and has 9" grinding capacity. 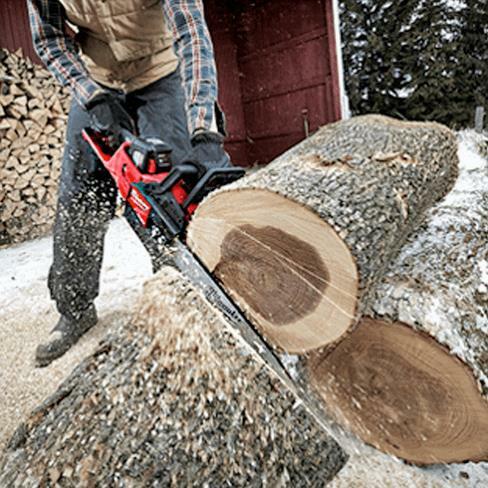 The Milwaukee M18 FUEL™ 16" Chainsaw delivers the power to cut hardwoods, cuts faster than gas, and delivers up to 150 cuts per charge. The unit is designed to meet the performance, durability and ergonomic needs of professional landscape maintenance, power utility, and the installed M18™ user. The M18 FUEL™ ½” Hammer Drill is the industry’s most powerful drill delivering up to 60% more power, up to 1.5” shorter length, and Up to 2X faster speed under heavy load. The M18 FUEL™ ½” Drill Driver is the industry’s most powerful drill delivering up to 60% more power, up to 1.5” shorter length, and Up to 2X faster speed under heavy load. The M18 FUEL™ ¼” Hex Impact Driver is the fastest, most compact and most powerful tool in its class, delivering up to 30% faster driving speed and 2,000 in-lbs of torque, at only 4.59” in length. Congratulations, you have been signed up to receive notifications about what's coming next! M18 FUEL™ is engineered for the most demanding tradesmen in the world. Delivering unrivaled performance in a compact structure, all M18 FUEL™ products feature three Milwaukee®-exclusive innovations—The POWERSTATE™ Brushless Motor, REDLITHIUM™ Battery Pack and REDLINK PLUS™ Intelligence Hardware and Software—that deliver unmatched power, run-time and durability on the jobsite. Simply put, M18 FUEL™ tools are the most powerful 18v cordless tools in their class. Designed, engineered and built by Milwaukee®, POWERSTATE™ is the best-in-class brushless motor that works harder and lives longer than all leading competitors. By converting energy into power and torque more effectively, this motor has up to 4X the amount of power-generating components than competitive brushless motors. POWERSTATE™ brushless motors are ideal for professional tradesmen because they deliver more application speed, torque and durability in a smaller size. Milwaukee's game-changing REDLINK PLUS™ Intelligence hardware and software is the most advanced system of cordless power tool electronics. 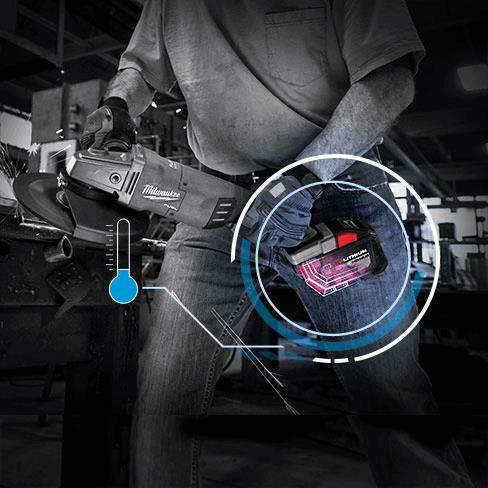 REDLINK PLUS™ Intelligence enables full-circle communication between tool, battery and charger, allowing for unmatched levels of performance, protection and productivity. Overload Protection prevents damage to the tool and battery caused by overloading or overheating. Provides optimal performance by adjusting to each tool’s unique performance requirements and applications. Enhances productivity with features like DRIVE CONTROL™ and on-board fuel gauge. Superior pack construction protects against impact & vibration, water, and heat to provide the most durable pack for the harshest environments. M18™ REDLITHIUM™ battery packs are fully compatible with the M18™ system. From compact right angle drills that provide access in tight access, to 1/2" drills that provide best-in-class power and durability, to high-powered drills for large diameter drilling and rough-in work, M18 FUEL™ drilling solutions cover the full range of drilling needs. Milwaukee is the industry leader in cordless fastening. By replacing pneumatic and corded tools, M18 FUEL™ fastening solutions cover the full range of fastening needs - providing unmatched power, runtime and durability - all while being the most compact in their class. M18 FUEL™ rotary hammers deliver faster than corded speed, durability and all-day runtime. Milwaukee offers a complete line of cordless rotary hammer solutions, ranging from compact SDS Plus to SDS Max. M18 FUEL™ Nailers deliver on the promise of peak productivity at your worksite, providing unmatched driving power, speed and efficiency - with practically no set up and minimal maintenance - creating the experience of a pnuematic nailer that professional carpenters and remodelers expect, without the hassle of compressors of hoses. From circular saws to band saws, M18 FUEL™ offers a full range of cutting solutions designed to outperform their corded counterparts - providing the power, runtime and durability to withstand the harsh conditions out on the jobsite. M18 FUEL™ grinders supply maximum sustained power to complete the toughest grinding, surface prep and cutting applications. We work with landscape maintenance professionals to understand their requirements for performance, durability, and ergonomics, developing outdoor power equipment solutions that have the power to outperform competitive 18V, higher voltage and gas-powered solutions. Milwaukee® is committed to providing unique, game changing solutions for their users - like the world's first cordless mud mixer, full-size cordless polisher, and drain cleaning solutions. All of these specialty tools are designed with the user in mind, increasing productivity by eliminating the needs for cords or hoses. Milwaukee® is committed to improving productivity by providing performance-driven and trade-focused solutions so users can perform an entire day’s work on one battery system. The M18 System includes 150+ tools, and is a true testament to Milwaukee’s focus on investing in technology to deliver breakthrough solutions for our users. *Due to the physical size increase of the M18™ REDLITHIUM™ HIGH OUTPUT™ HD12.0, it does not fit the following tools prior to a 6/1/2018 manufacturing date without applicable service part: 2787-20, 2788-20, 2771-20, 2122-20, 2130-20, 2135-20, 2361-20, 2145-20, 2146-20, 2360-20. Milwaukee is committed to protecting end user’s investments, offering FREE service upgrades for the listed products to any customer that purchases a HIGH OUTPUT™ HD12.0 battery pack ( starting summer 2018 you will be able to visit e-Service to request your service part).